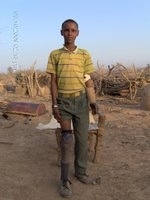 Landmine survivors are mostly innocent civilians and defenseless children. Children lose their limbs to landmines while herding livestock, fetching drinking water, collecting firewood for the family, or going to school or worship places. Most child landmine survivors come from poor families in mine affected areas of the world. Walking to school and keeping up with the family needs becomes impossible for an injured child. Thus, survivors are either confined at home or left on streets to become beggars and generate income for the family. CALM works to raise public awareness across the United States and support child landmine survivors rehabilitation & access to basic education. CALM also calls for intensified mine clearance (demining) in all regions of the world affected by landmines and explosive war remnants.